The strength of the headwind is directly proportional to how late you are. The probability of getting a puncture approaches 100%. Said puncture will occur just far enough from home that you can’t go back & swap for another bike. Rims & tyre will be grimy enough to make your hands properly filthy. So guess what happened to me last night. ‹ Where Is My Pashley? Disposable gloves should be part of yor puncture kit. The kind that you find next to the diesel pump at supermarkets or in the supply cupboard at hospitals. Then rule # will kick in. You’ll not bother to put them on to save time thinking it won’t be as messy as it turns out to be. Been there. Patches only to be used when indoors. Wise man always brings spare inner tube. 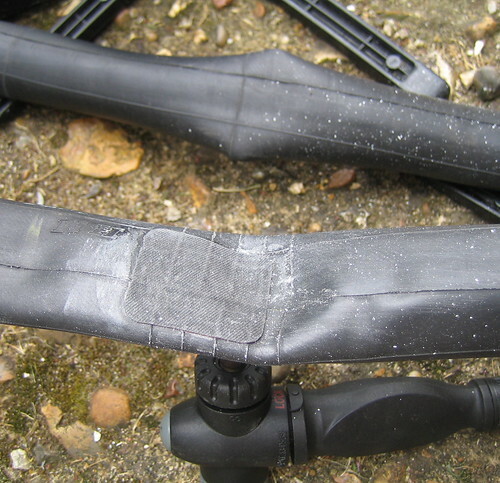 Wiser man says always carry a spare inner tube AND a repair kit to fix the pinch flats you get when fitting the new inner tube.